Always carry chains during winter mountain driving. Expect weather related delays. 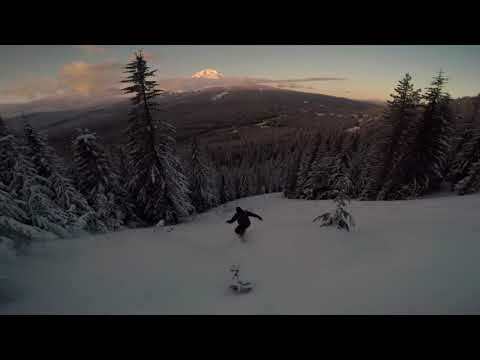 Mount Hood Skibowl is the closest mountain resort to Portland. We are approximately 50 miles East of Portland on US Highway 26 in Government Camp. Travel time from downtown Portland is about one hour without delays. The Ski and Snowboard School is in the parking lot of Skibowl West which is on the right hand side of Hwy 26 just as you crest the top of the pass. Our resort has machine groomed runs yielding an excellent riding surface under virtually any weather conditions. Come on up and have fun! You can get Snow Conditions at the mountain by calling 503-222-BOWL or going on our website at www.skibowl.com where you can get current weather as well as view the conditions live on our web cam. The Liability Release Form must be printed and brought with you class sign-up. Next fill out the online Rental Self-Entry information. This will save you time at the mountain and speed you through the rental shop. Click here for the Olympic Ski and Snowboard School RELEASE FORM. Click here to enter your information for your rental gear and save some time! All Mt. Hood area ski resorts are on US Forest Service property. The Oregon Department of Transportation (ODOT) requires a winter ‘parking permit’ on every vehicle. The small fees collected for these permits help offset expenses related to keeping the mountain roads open during the winter. These permits are sold at many stores in the Portland region and at most stores and gas stations along the Hwy 26 route up to the mountain. Parking passes are also available at Guest Services at Skibowl but it is much simpler to purchase the pass ahead of your arrival. Oregon State Police officers patrol our lots regularly and the there is a penalty for parking without a permit. The Ski and Snowboard School does not sell parking permits. Private tubes and sleds are not allowed anywhere on the Skibowl resort property for several reasons. One is that they are a danger to skiers and snowboarders. Please do not bring them. 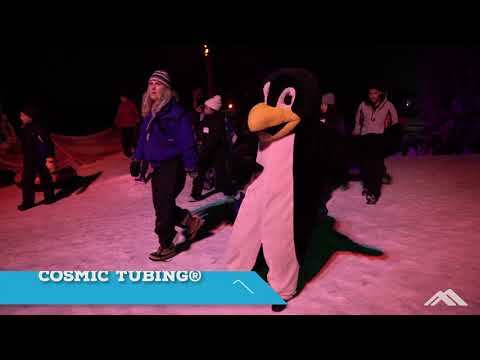 Skibowl East has a professional tube park with a lift and special tubes. This park is great fun for the whole family and very popular. Full details are available on the Skibowl website. The Rental Shop at Skibowl has outer clothing such as pants and jackets for rent. The outer layer is usually the most expensive to purchase and many first timers prefer to rent. We also rent helmets in our Pro Tuning shop located next to the Rental shop. And we have a full retail store next to Ticket sales which sells gloves, hats, goggles, sunglasses, sun screen and other winter related items. Sun screen on all exposed skin is a near necessity on the mountain regardless of the cloud cover. Temperature and precipitation conditions at the mountain will change rapidly. Be prepared for anything but remember that you are engaging in an sport which will require a full range of body movements so don’t wear constricting garments. Children especially have a very hard time moving when overdressed in heavy clothing. The first layer is usually composed of long underwear designed to wick moisture away from your body and keep you dry. Second layers are there to keep you warm and are often made from wool or fleece. The third or outer layer should keep wind and moisture from entering. Wear a coat and pants (either bring your own or rent from our Rental Shop) that are preferably water-resistant. Even if there is no precipitation that day, beginners may get wet through falls or sitting on the ground. Wear a hat or helmet to keep your head warm and dry. Helmets are great and recommended for intermediate lessons where your speeds will start to build although they are not a school requirement at any level. Gloves are a necessity and should at minimum have reinforced leather palms as our beginner slope is serviced by a rope tow. Avoid knit or fleece gloves. If you can, bring extra gloves as your first pair will often get wet (especially kids, especially in lessons) and once they are wet they won’t keep you warm. Socks are important but more is not better. Don’t expect to wear two or three pair of socks in hopes of keeping warm. One pair is enough. The boots for skiing and snowboarding will keep you warm. Finish the outfit with a pair of sunglasses or goggles if you want. If you expect precipitation on your lesson day this last item is a necessity, especially for people who are beyond their first lesson and going up on the lifts. Trying to ride without goggles while snow is falling is nearly impossible. And remember that most of the heat in your body escapes through your head so if you are wearing your goggles on top of your head while walking around, they will be hopelessly fogged over by the time you need them. Keep your goggles dry. If you are going to be taking a lesson and you will be needing rental equipment, stop at the Ski and Snowboard school first. We have lesson packages that include equipment rental at a special package price and you may get a better value than you would by renting your equipment separately and then buying the lesson. Our packages also include the lift tickets so again, come to the school first. If you have your own equipment and are taking a Group lesson, our staff may want to inspect your equipment prior to selling you a lesson. Some older skis do not fit with the learning progression we use in our Group lessons and will cause the student to struggle and lag behind the rest of the class. Similarly, Snowboards and Skis without metal edges are toys and will not be allowed in a lesson. We may encourage or insist that people wanting to use their older equipment take a Private lesson or allow us to equip you with our modern rental equipment to ensure a quality lesson experience. Skis or snowboards which do not have devices designed to stop run-away equipment are not allowed at our resort. Brakes on skis and leashes on boards are mandatory. SHOULD I LEARN TO SKI OR SNOWBOARD? Both are fun and easy. If you are learning to ski you should expect that it will be very easy to learn and master the basics but that it may take some time to learn and master the finer points of intermediate to advanced skiing. But skiing at the lower intermediate level is still a great deal of fun and some folks never bother to progress further. If you are learning to snowboard you should expect that it may be a bit slower in the beginning, more physically demanding than beginning ski lessons and overall just a little more difficult to learn and master the basics. But, you will also likely discover that the progression to learning and mastering the intermediate skills of snowboarding is often much quicker than with skiing. Both riding platforms have their advantages and disadvantages. For these reasons, little children (young or small in size) sometimes do better with skiing until their legs and balance are more fully developed. Likewise, people who are seriously out of shape and/or have very weak ankle joints may do better with ski lessons because learning the basics of snowboarding will require you to fall and get back up many times (when compared to skiing). 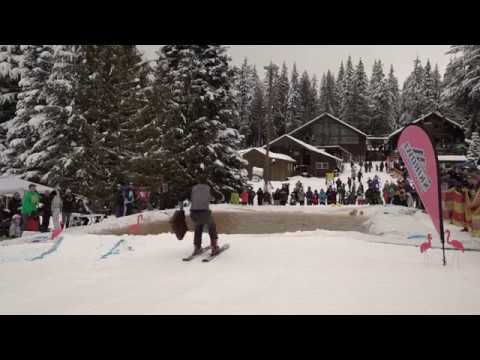 If you get tired or sore very quickly skiing may be a better platform to learn on. Private Lesson— Private lessons (one student with one instructor) are a great way to learn, perhaps the best, and we encourage them for all age groups but be aware that they are offered on an availability basis only. That is to say that during our busiest times we may not have available instructors for Private lessons at the time slots you wish. If you arrive on a weekend or holiday, walk in to the School and check availability for a Private lesson for that day . Private lesson availability during the Christmas Holiday period is extremely limited. A great way to ensure your Private lesson availability is to schedule it on a non-holiday midweek day but if it has to be on a weekend day the very best opportunities are at 9 a.m. and between 3 to 7 p.m.
Beginner Group Lesson— The majority of the lessons we sell are Group lessons consisting of students of all ages and backgrounds. Beginner Group lessons typically have from 3 to 8 students and will last two hours. The class may consist of students in a wide range of ages, backgrounds and physical abilities. If you are in a Beginner lesson your weather environment will be pretty much what you are seeing in the parking lot so dress for the lesson accordingly. The beginner slope is actually below the parking lot level. Guaranteed 1-2-3 Learn to Ski/Snowboard Package—This package gives the student three lessons spread over three days (which can be a single day apart or several months) in a single operating season. These lessons are offered in both Group and Private format and come complete with equipment and lift passes. The three lesson packages are so well priced and effective in giving you the skills you will need to explore all of our terrain that we offer considerable incentives to encourage you to sign up for this package. Those incentives (available upon completion of the third lesson) include a 50% discount on lift and rental costs for the remainder of the season or if you would like a Season Pass you may purchase Season Pass at 1/2 price! Ask at the School office for more details. This package gives the student three lessons spread over three days (which can be a single day apart or several months) in a single operating season. These lessons are offered in both Group and Private format and come complete with equipment and lift passes. The three lesson packages are so well priced and effective in giving you the skills you will need to explore all of our terrain that we offer considerable incentives to encourage you to sign up for this package. Those incentives (available upon completion of the third lesson) include a 50% discount on lift and rental costs for the remainder of the season and a Season Pass. Ask at the School office for more details. Intermediate and Advanced—We offer lessons catering to every skill level up to and including a Advanced Ski and Ride clinic every Saturday and Sunday @ 1:00(Ski), 1:30 (Snowboard) afternoon. Please ask at the School Office if you are interested in an intermediate lesson (beyond the first class) or above. Christmas Holidays, Other Holiday weekends such as MLK, Presidents Day and Non-holiday weekends in December - Febuary, March weekends. Our least busy times are non-holiday weekdays (Monday through Friday). Note: On busy days and times we increase our instructor staff so don’t be discouraged from coming but if you do come on a busy day expect some delays such as the following: The drive up will be slower. Parking will be a bit farther from the school. There will likely be a line at the school and a line at the rental shop. The Group Classes will be a little larger. We always advise people to arrive in the parking lot at least one hour prior to your desired class time. On our busiest days you should increase that lead time to 1 ½ hours. Children under 4 / 6 for snowboarding cannot be accepted in any of our lesson offerings. In our experience giving winter sport lessons we have learned that children younger than 4 years old do not have the strength or ability to focus necessary for the lesson to be of value to the purchaser. .
Students 8 yrs through 11 yrs of age can sign up for Group lessons or Private lessons. The only restriction with this age group is that they can not sign up for continuous multiple hour lessons (such as half day Private lessons or two one hour Private lessons back to back). They can sign up for additional Group or Private lessons later in the same day but we do not offer continuous multiple hour lessons for this age group. At the school you need to be 18 years of age or older to sign for a lesson. Younger students must have a responsible adult present (18 years or older) to sign the necessary paperwork. If you are the ‘responsible party’ that is paying and signing our forms, you will need to know the full name of each student, their birth date, their weight, their height and their shoe size. It’s a good idea to write down all of this information before leaving home so that it’s easy for you (and us) to get it down quickly and correctly on these forms. The Release Form (explained below) is available on-line for you to print out and fill in at home and you are encouraged to take advantage of this feature. The school building itself has limited space so please don’t bring the whole family into the school. Again, you can park your car right in front of the School while filling out the paperwork. The only people we need in the School building itself (and all we have room for) is the person doing the signing and the paying. You will be filling out and signing two forms. The first is a legal Release form which protects the school from harmful or frivolous lawsuits arising from student dissatisfaction or self-inflicted injury. The form states, in layman terms, that skiing and snowboarding can be hazardous and that you are entering into the lesson “at your own risk.” It is extremely rare that students are hurt during a lesson but this form is a necessary part of business. The release form will ask you to list the name, date of birth, and winter sport skill level (usually zero) for each student that the signer of this form is paying for. All students 18 yrs of age or over must sign the Release form. Next you will fill out an online equipment rental form (if you need equipment) and here you will need the student’s name, winter sport skill level, age, height, weight and shoe size. Once you have paid it is time to get you into your equipment (if your package includes rental gear). If you are taking a Ski lesson (as opposed to a Snowboard lesson) you or the student you are responsible for will be receiving their Ski equipment at the rental shop, and proceed directly to station 3. Beginner and Intermediate lessons at Olympic Ski and Snowboard School are based upon the teaching and learning models developed by the Professional Ski Instructors Association of America (PSIA) and the American Association of Snowboard Instructors (AASI). Our instructors are certified members of PSIA and AASI and every year our instructors spend a good deal of their time taking lessons themselves and learning to become better instructors. This is an ongoing process that the school and its instructors are proud of and work very hard at. Our Beginner and Intermediate lessons follow a consistent and reliable progression of skills development which results in a successful outcome for the vast majority of students. PSIA and AASI have developed the basic skill progressions that are used at most winter resorts throughout the United States. Instructors of Group lessons follow this Progression very closely and the instructor has a target of how far the class needs to get before the lesson is over. . Please show up for the lessons on time. Make sure that the student has had a recent bathroom break and is well rested prior to the lesson. Good hydration is a necessity on the mountain and water is still the best source for this. In order to keep energy levels high, make sure the student has had enough liquid prior to the lesson. First Timer Lesson begin with a 5 minute talk where the instructor will get to know everyone in the class, discuss how the equipment works and outline what will be taught in the class. From there the class will move to a different area of the beginner slopes for the actual lesson. This initial learning area could be a few feet or over 30 yards away from the group assembly area so students shouldn’t show up for the class with their skis or board on because the class will be walking to the practice area. If you are the guardian of a young student please hang around long enough to hear this ‘talk’ part and to see where the instructor is taking the class. Young children typically perform better in lessons when their parent is not visible to distract the child. Please consider this as you leave your child for their lesson and if you watch, try to do so from a discreet distance. The desired outcome for a first day student is to overcome the possible fear or uncertainty that is common for any new endeavor and to learn to slide straight and to turn and stop. Learning to use the rope tow, becoming independent of the instructor and being capable of practicing on their own are other accomplishments you can expect. First day students should not expect to be able to ski/ride well enough that they will be ready to ride the conveyor lift to the top and ‘rip it up’. Students should expect to gain some valuable and fun skills along with a good dose of confidence. Most students fall a few times while learning and will use muscle groups not called into action during other activities so they might expect to be a little tired and sore by the end of the day. PARENTS please make sure you return to the place where the class began - a few minutes prior to its scheduled conclusion . This is critical. Our instructors often will be scheduled into classes back to back and will not have time to watch your child after the class. If for any reason we are not able to find you after the class we will take the child to our Ski School Office and check them in at your expense. INTERMEDIATE LESSONS (anything beyond the first lesson) will be on one of our lift serviced slopes or West Rope Tow. It will be colder at the top (1500 feet above the parking lot) than it is at the bottom so students shouldn’t show up for lessons in a tee shirt just because the parking lot is nice and cozy. Second day students should expect to refine their basic skills of sliding, turning and stopping and to add new skills like riding the lift to the top of Lower Bowl; learning more about linking turns together; controlling speed; increasing focus; improving balance; controlling the edges of their skiing/riding platform(s); and, facing longer and a bit steeper runs successfully. Their fun will be even greater than that first day and they’ll still be a little tired and sore at the end of the day. Third and subsequent day students will be getting rid of bad habits accumulated along the early learning path; making longer and steeper runs without stopping; increasing speed with the confidence they can still turn and stop; and more advanced techniques for turning and stopping. As balance and edging movements become more efficient, confidence will build and energy output will start to decrease. The student will begin to capitalize on their newfound understanding of how simple body movements affect the riding platform. At the end of the day the student should be able to ski/ride the lower lifts and ski or snowboard down most of the lower runs. By now they will be hooked on the thrills of skiing/riding and will not be as tired or sore anymore. They can go all day and will certainly want to. This is very rare but it does happen and if it does there are things you should know to assist you and our mountain personnel. First, if you are hurt in a lesson let the instructor know immediately. The instructor will stop the class and determine if rest or medical care is needed. If medical care is needed the instructor will call for the Ski Patrol which is a group of professionals with EMT certifications. Ski Patrol will examine and, if necessary, transport the patient to our on-site medical holding facility where licensed medical professionals will provide initial care. If you are a parent or guardian of someone who is hurt you will be asked to meet your student at one of our medical facilities. If the injured party was skiing/riding on the Skibowl West side they will be in our Skibowl West First Aid room located at the Skibowl West lodge and below our Beer Stube. If they were skiing/riding on the Skibowl East side they will likely be at our First Aid room in the Multorpor Lodge.